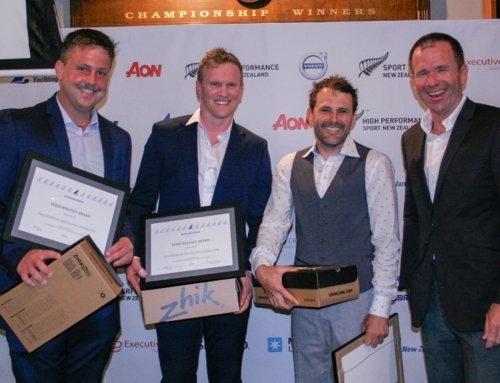 Royal Akarana Yacht Club’s ANZ Sail Fiji Ocean Race has drawn to a close amidst a sea of celebrations which spanned from country to country. It all began on Auckland’s Waitemata Harbour on Saturday 7 June at 1300 hours with 20 boats in the racing fleet staring off Orakei Wharf amongst a flurry of shore side and water based supporters, well wishers and fans. The intense match race between Beau Geste (Karl Kwok) and Giacomo (Jim Delegat) provided live action for those jumping for joy high above on North Head. The fleet endured a mix of conditions ranging from “crashing, banging and bashing” during the first 48 hours, to torrential rain and even moments of ocean drifting. Beau Geste secured both the line honours and the overall PHRF win, an excellent achievement by Karl Kwok and his crew who raced under the burgee of Royal Hong Kong Yacht Club. “The best part of the race was the last six hours coming into the finish line because all the choppy sea state had disappeared and the sun was out. We are very happy with the boat!” said Kwok post-race. Beau Geste crew member Michael Quilter won the Gary Francis Memorial Trophy donated by Kerikeri Cruising Club to be awarded to the navigator of the line honours boat. It was fitting for Quilter to win this award as he is a member of KCC and new Gary Francis well. Jim Delegat’s Volvo 70 Giacomo secured the overall IRC win by just 3 minutes over Beau Geste which was a major highlight for the crew. 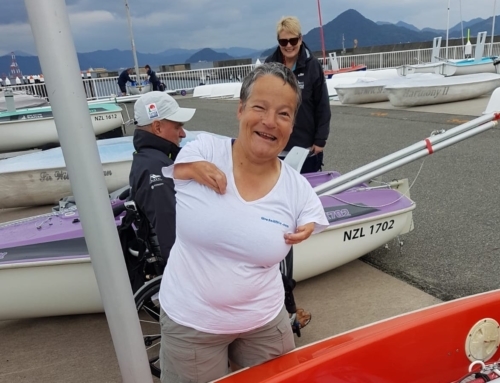 “It was just a fantastic race the conditions were everything that they said they would be, they threw everything at us and it really determined the way we were going to sail the boat and more especially it was all about crew work. It was a great result and we sailed really hard from the beginning and that showed off by going east and then sailing high it enabled us to position ourselves and coming through with three minutes to spare on handicap and taking IRC has to say that it was a great sail. The crew was fantastic, the boat sailed really well and I would just love to say, that we will come back again,” said Delegat. The hotly contested Nifty Fifty fleet kept within close reach of each other for the entire race but it was David Nathan’s V5 (TP52) that secured the line honours win for this division ahead of Vamos (Connel McLaren), Wired (Rob Bassett / Brett Russell) and Akatea (Gary Lewis). The Nifty Fifties trophy went to Vamos (Connel McLaren) on PHRF. The biggest match race of the regatta was between Squealer (Bruce Goodchap) and Django (Andrew Reid). After 1,100 nautical miles, it was Squealer who pipped Django at the post by just 10 seconds. The entire race these two boats were on each other, with the tracker clearly showing the romance which developed between these two boats and their crews. “It was hard to comprehend at the time what we were involved with, but it was really an epic race, made even better by the fact that it was against our good friends. “I have known some of these guys for the best part of 20 years, and can genuinely say that we could not have hoped to be beaten by a better team,” said Django crew member Andrew Pilcher. Squealer were too busy squealing with excitement to say to much as the celebrations began as soon as they stood on the dock. Django won the European Cup which is an artistically designed trophy donated to Royal Akarana Yacht Club by the Needham brothers (Lawless). John Miller and his Blizzard crew cleaned up on the podium claiming the win in PHRF Division 2, 3rd on IRC and 1st on General Handicap, 1st Naughty Forties as well as securing the Classic Kiwi win. “We just loved it!” said Miller at the prize giving. The final boat to cross the finish line in Fiji was Outrageous Fortune. Owner/Skipper Quintin Fowler and his crwe arrived in Port Denarau Marina in the early hours of Sunday morning after the prize giving to a welcoming crowd glad that they had arrived. For Quintin and his crew, just getting to Fiji was enough for them to put behind them the dramas of their previous journey to Fiji. “The crews all fine, everybody is ok, we’re good. Now all we’ve got to go do is give our two bottles of rum to Christiaan (Notorious), boy, that’s going to be fun!” joked Quinton on the dock. The friendly rivalry between Notorious and Outrageous Fortune has taken place for many years and many miles, and will continue in the future as well. “I’m glad that I have Quintin to compete against, he’s an awesome competitor and a good boat too,” said Christiaan Arns post race. The Interclub challenge went to the Royal Akarana Yacht Club’s Pahi Tere Team which consisted of Giacomo (Jim Delegat), Akatea (Gary Lewis) and Bullrush (Ant Robinson). ANZ Sail Fiji is confirmed for 2016 with ANZ announcing at the prize giving of their commitment to sponsor the event again. Port Denarau Marina will host Royal Akarana Yacht Club in 2016 with a relationship secured between the two organisations. Royal Akarana Yacht Club would like to thank the sponsors ANZ, Evolution Sails, QuickDry Foam, Burnard International and Dimension Polyant for their support of this great event and to Nigel Skeggs at Port Denarau Marina for hosting the fleet whilst in Fiji.